TRAVEL & ENTERTAINMENT: Meet the Hopeful, Resilient Residents of �The Jungle,� Now Playing at The Curran in S.F. �The Jungle,� currently performing at the Curran (455 Geary Street) in San Francisco through May 19, is the heartbreaking yet hopeful story of strangers from 25 countries who meet at a refugee camp in Calais, France. Don�t expect to sit back and be entertained. The Curran has been transformed into part of the camp known as the Jungle, and as part of the audience you will sense and feel the chaos, sounds, and raw emotions of the place. Part of the audience sits in the re-imagined Afghan Caf� exquisitely created by award-winning set designer Miriam Buether. Joe Murphy and Joe Robertson based their award-wining story on the several months they spent at the camp getting a deep sense of place and individual stories. The play is perfectly directed by Stephen Daldry and Justin Martin. The performances are evocative and real. Many of the actors came from refugee camps, some even from the Jungle. You will not soon forget the story of Okot who endured a brutal journey to get to the camp or of Norullah who rehearses getting smuggled into England on a truck or of any of the actors in this hugely important work. It�s a story that needs to be told now more than ever. Run time for �The Jungle� is 2 hours 50 minutes with one 15 minute intermission. For tickets ($25-$165) or more information please visit www.sfcurran.com/jungle. 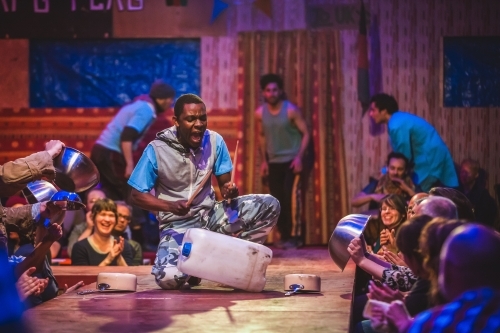 Photo caption: Okot (John Pfumojena) in �The Jungle,� performing now at the Curran in San Francisco through May 19.